In the charm stakes, he's hardly Cary Grant, but the goofy-looking amphibian in The Shape Of Water upholds a tradition of monster movies that has captured the public's imagination since the early days of cinema. Guillermo del Toro's genetically-modified story of love blossoming between his merman-like star and a mute human underscored the popularity of the genre on Sunday, with Oscars wins for best picture and director. The old Universal creature features, modern Japanese ghost stories and innumerable gorefests involving the undead in various states of decay might trouble even the sturdiest constitution. But the monster movie straddles numerous genres other than horror -- from comedy and fantasy to science fiction -- and Del Toro is capitalizing on cinema's love affair with the cuddly, loveable end of the market. "Monsters aren't always frightening or evil. The monsters of Pixar's Monsters Inc. and certainly the title character of Harry And The Hendersons were charming and sweet," writes John Landis, director of An American Werewolf in London (1981), in his book Monsters in he Movies. "Even the most famous monster of them all, the Frankenstein Monster as portrayed by Boris Karloff in 'Frankenstein,' is vulnerable and sympathetic." Paul Wegener's 1915 German silent film The Golem is widely regarded as the first creature feature, while Nosferatu, still one of Germany's most iconic horror films, came along seven years later. US filmmakers got the bug in the 1930s, producing a series of German-influenced gothic tales about Dracula, Frankenstein, the Mummy and The Invisible Man. Spool forward a few decades and Jurassic Park (1993), Cloverfield (2008), Troll Hunter (2010) and Del Toro's own Pacific Rim (2013) have all proved critical and commercial hits. King Kong (1933), perhaps the most popular behemoth of them all, has become a cultural icon through various Japanese and US movies, with the most recent iterations, King Kong (2005) and Kong: Skull Island (2017), recouping more than $1 billion worldwide. Other milestones include the stop-motion monsters of visual effects guru Ray Harryhausen, from Mighty Joe Young in 1949 through Jason And The Argonauts (1963) and Clash Of The Titans (1981). Harryhausen's dinosaur flick The Beast From 20,000 Fathoms (1953) ushered in the wave of 1950s creature features capitalizing on the nuclear paranoia of the age. The Creature from the Black Lagoon (1954) provided the inspiration for the look of Del Toro's amphibian humanoid in The Shape Of Water. Kendall Phillips, a Syracuse University professor and author of the recently published "A Place of Darkness: The Rhetoric of Horror in Early American Cinema" said the "otherness" of monsters frightens us. But it also provokes empathy, he maintained, because "deep down inside, all of us sometimes feel a little bit like a misfit and a monster." "King Kong is a horrible threatening monster that does dangerous things, and yet one cannot help -- whether it's the 1933 version or the most recent version -- to have a certain level of sympathy," he told AFP. Demons from the deep aren't always cinematic gold, of course, and among the failures Phillips highlighted Universal's The Mummy (2017). The Tom Cruise actioner was was supposed to launch the studio's "Dark Universe" franchise, rebooting all its classic monsters, but it flopped spectacularly, scoring a 16 percent approval rating on Rotten Tomatoes and losing an estimated $95 million. "It's funny that the same year, Guillermo del Toro releases a movie that is a beautiful love letter to that era, that really captures the spirit of all of those monsters beautifully," Phillips told AFP. The academic said The Shape Of Water proved to be the perfect antidote to America's divisive culture wars, with their unrelenting message from certain politicians and other public figures to "fear the other." "Here we have this movie that tells a beautiful love story really, about two entities who feel disconnected and not part of the world, and are somehow able to bridge that gap," he said. 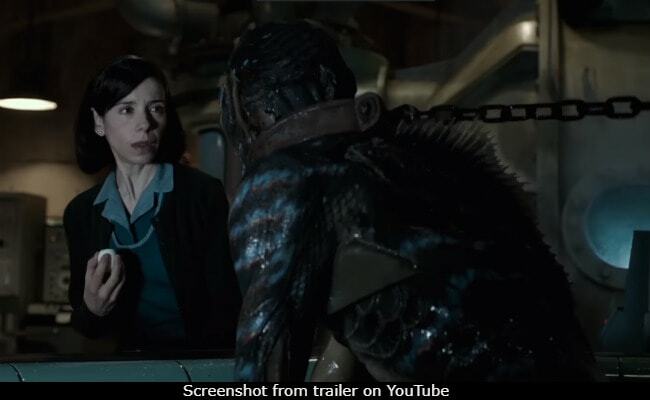 Not all resonant movies win Oscars, of course, and one of the main strengths of The Shape Of Water, according to many critics, is its middle-of-the-road inoffensiveness. While it may not have been as beloved as the best picture favorite Three Billboards Outside Ebbing, Missouri, it wasn't hated either, and likely didn't rack up last place rankings on voters' ballots. Three Billboards, was acclaimed by critics but is likely to have garnered as many last-place votes as top rankings due to a backlash over how it appears to absolve one of its main characters, a violent, racist police officer. Daniel Montgomery, of awards website Gold Derby, said he had expected The Shape Of Water to win best picture despite its "unorthodox interspecies romance." "Granted, films don't always need to feel good to win Oscar. Just look at gritty best picture winners like The Departed (2006), No Country For Old Men (2007) and The Hurt Locker (2008)," he wrote. "Three Billboards would have fit that darker mold. But on a preferential ballot, it might help to be huggable."